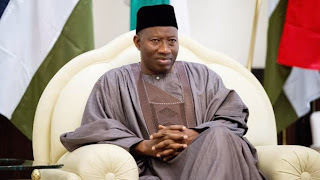 President Goodluck Jonathan has given an insight into the fate that awaits him and his ministers after May 29, saying he believes they will be persecuted. He stated on Sunday during a thanksgiving and farewell service organised in his honour at the Cathedral Church of the Advent, Life Camp, Gwarinpa, Abuja that the persecution would happen because of the “ hard decisions” his administration took while in office. He said that experience had shown him that people would at a time desert anybody who took “hard decisions” like he did while in office. Jonathan added that he had always believed that more of his friends would desert him after May 29. The President recalled the story of the last ruler of apartheid South Africa, Frederik de Klerk, who was divorced by his wife for accepting to abolish minority rule in the country, and said jokingly that he hoped his wife, Patience, would not also divorce him after the end of his tenure on May 29. Her response was greeted with a loud applause by congregation members. The President said, “I believe there are reasons for everything. Some hard decisions have their own cost; and there is no doubt about that. “That I have run the government this way that stabilised certain things, the electoral process and other things that brought stability to this country. They are very costly decisions which I must be ready to pay for. “Some people come to me and say this or that person, is he not your friend that benefitted? Is it not your government that this person benefitted from? But this is what the person is saying. “But I used to say that worse statements will come. If you take certain decisions, you should know that those close to you will even abandon you at some point. “And I tell them that more of my so-called friends will disappear. When de Klerk took the decision to abolish minority rule in South Africa, even his wife divorced him. I hope my wife will not divorce me. But that is the only decision that has made South Africa to be a global player now. If they still have minority rule, by this time, nobody will be talking about them. “If you take certain decisions, it might be good for many but it might affect others differently. So, for ministers and aides who served with me, I sympathise with them because they will be persecuted. They must be ready for persecution. Jonathan however said he was happy that ordinary Nigerians appreciated what he did and that, according to him, is most important. He said it was not what the elite talk about or say about his administration that mattered to him but what the majority of the Nigerians felt about his actions and inactions. The President expressed delight that he came to Abuja with his family peacefully and was leaving peacefully.